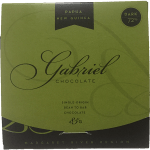 Being based in the Margaret River wine region of Western Australia is a perfect fit for Gabriel Chocolates. The first bean-to-bar chocolate maker in WA, Gabriel makes single origin chocolate in small batches, with a focus on how terroir influences the chocolate flavour. In his factory in Yallingup he hand sorts, roasts, winnows, refines and conches cacao beans from around the world. The factory also includes a retail space with lots of information about where he sources his beans and how the chocolate is made – the perfect stop on a wine-tasting tour! Gabriel also makes bean-to-cone ice cream! Pop in to their Margaret River or Fremantle stores for a taste.